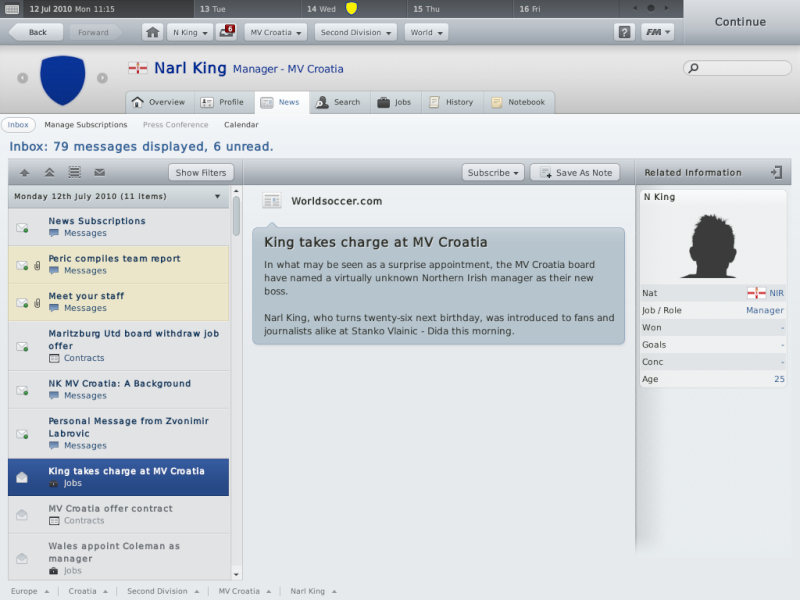 Starring Narl King, manager of MV Croatia, 2nd Division team in Croatia. This winter... let your adrenal glands burst with excitement. As the summer ended, and autumn was arriving in Croatia... Narl King looked back on his first 7 games with MV Croatia with mixed emotions. 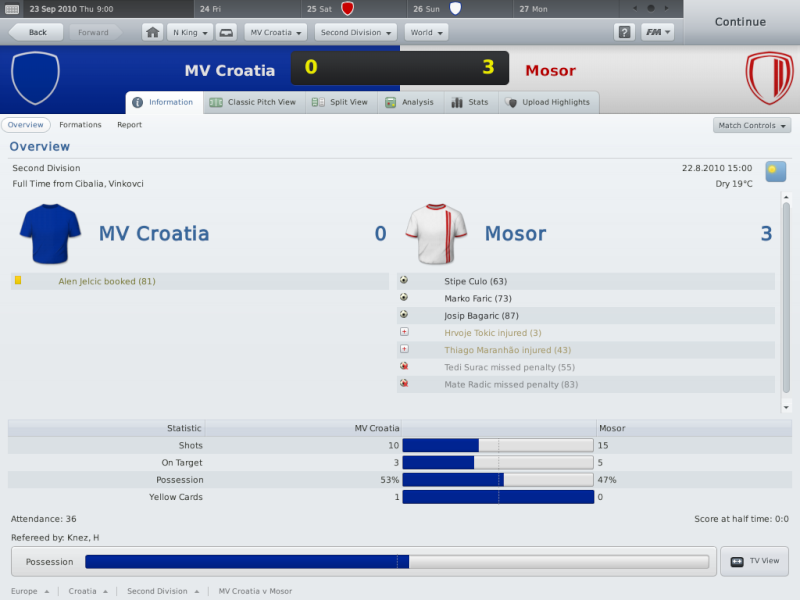 After signing a few of the amateur players in the team, the season kicked off with a 3-0 loss at home against fellow relegation candidates Mosor. Things did not look well. ...and then we were at home to Zagreb, the 1st division team that we were expected to lose to. I had all but no hope for this game, and thought we were going to be like lambs to the slaughter. I was proven wrong and had severely underestimated my team's fighting spirit. 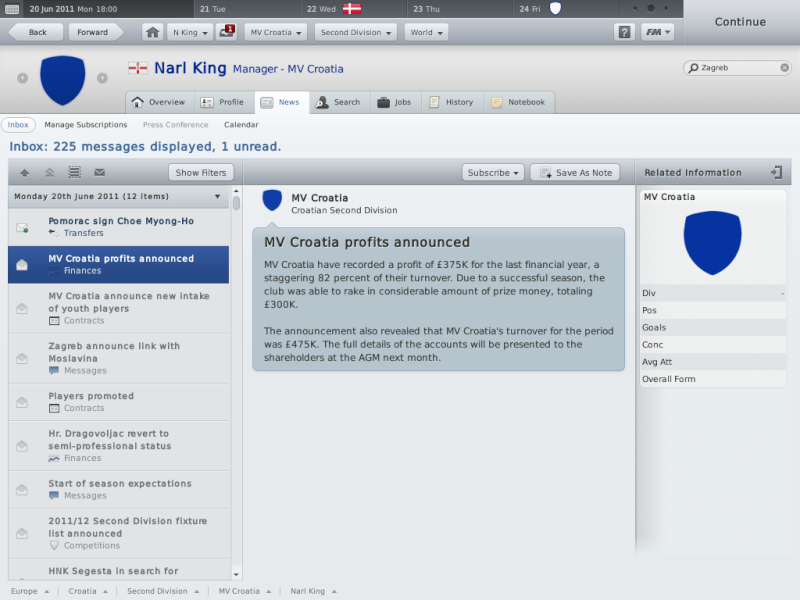 As King looked ahead and saw the Eastern European winter approaching, he wondered, what next for MV Croatia? Join him on his journey in Croatia, and stay active with your posts. Liking the videos, gives the updates a nice touch. Wow Narl, that's an absolute amazing report there, keep up the great great work! Really nice stuff here so far mate! GL with MV Croatia & KIU! Really nice stuff here so far mate! GL with NK Dinamo & KIU! 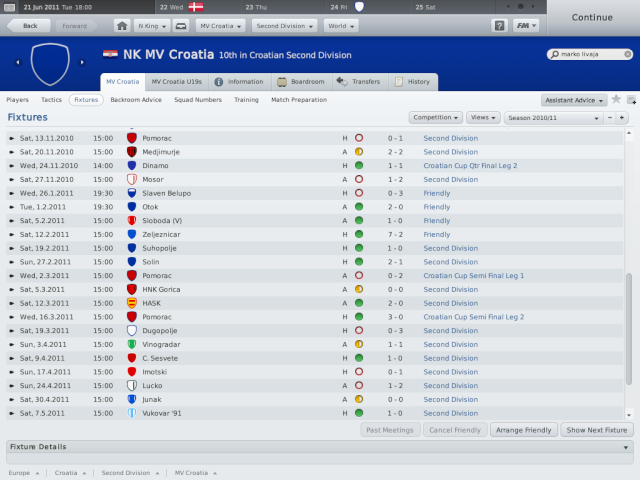 Hmm, when you say NK Dinamo, do you mean me playing against them Jelly? "hmm. 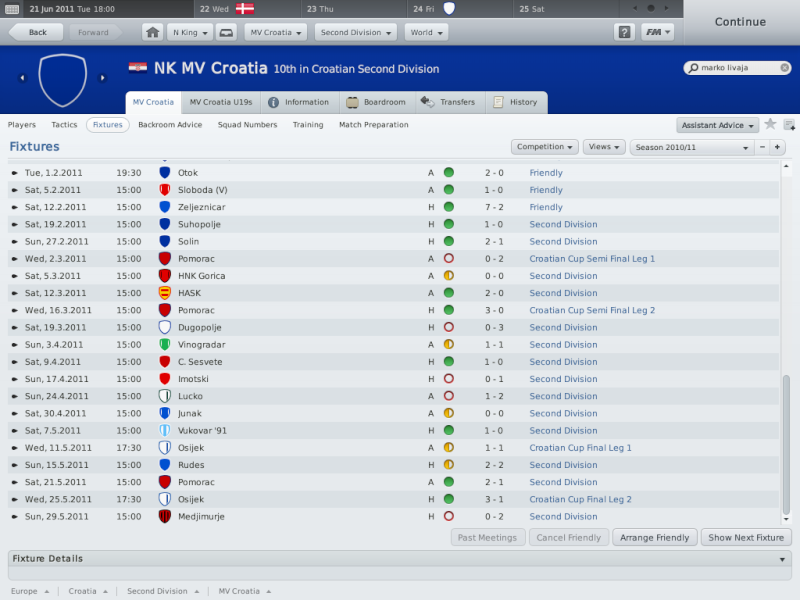 Might need to up my game here"
13th after 16 games, 14 games left, can MV Croatia survive the drop? Only time will tell. 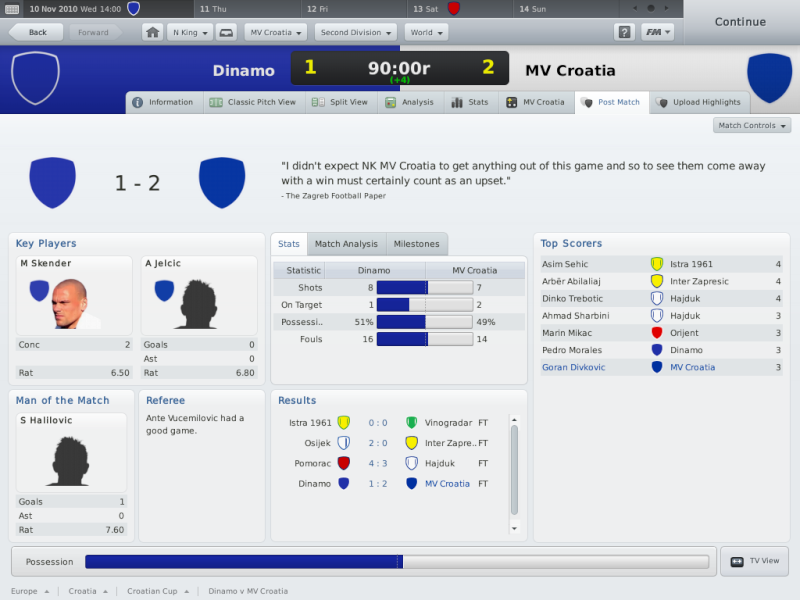 But there's always a silver lining, as MV Croatia pulled off the unthinkable in the Croatian Cup and beat Dinamo, 4th in the division 1, 3-2 on aggregate to launch MV Croatia into a Semi-Final. And what's even more worrying for Narl King, is the fact the team are now on a 6 game run without a win in the league, relegation form in the relegation zone. Can the team bounce back for the rest of the season? 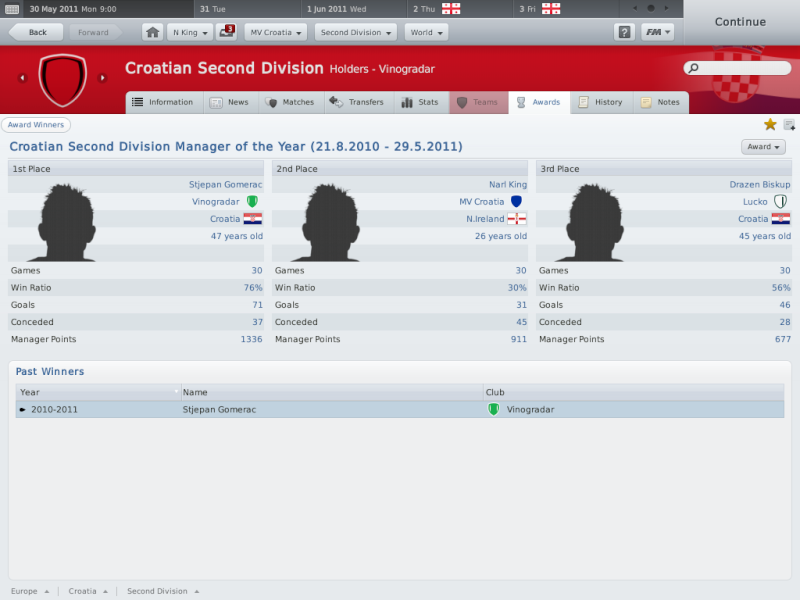 Can they win the Croatian Cup, which they have defeated several giants in? You will soon find out as From Croatia with Love reaches its climax. 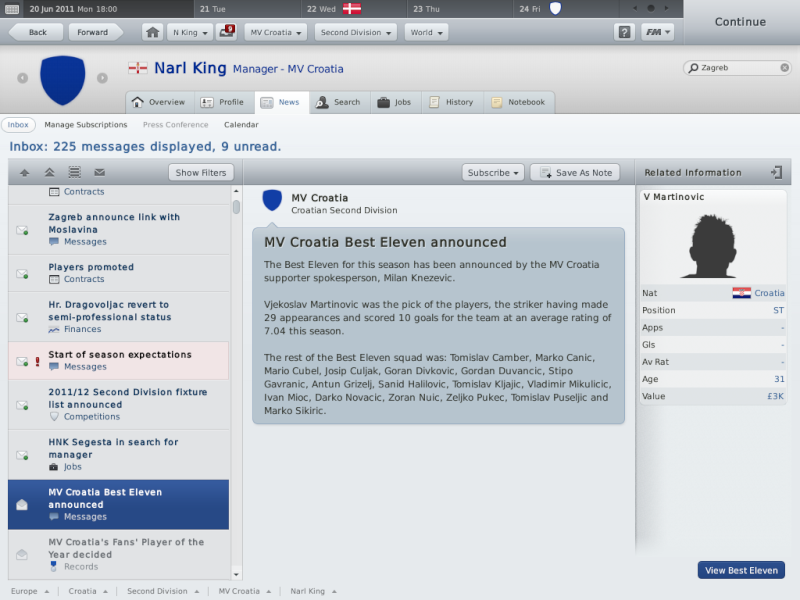 I hope you do win the Croatian Cup mate, you're doing pretty well, your updates are always top notch, fun reading. Good luck matey, all the best. Of course you can win the cup! Do you get into Europe if you do? Great updates as always, will continue following it. I'll let you know soon as I find out! 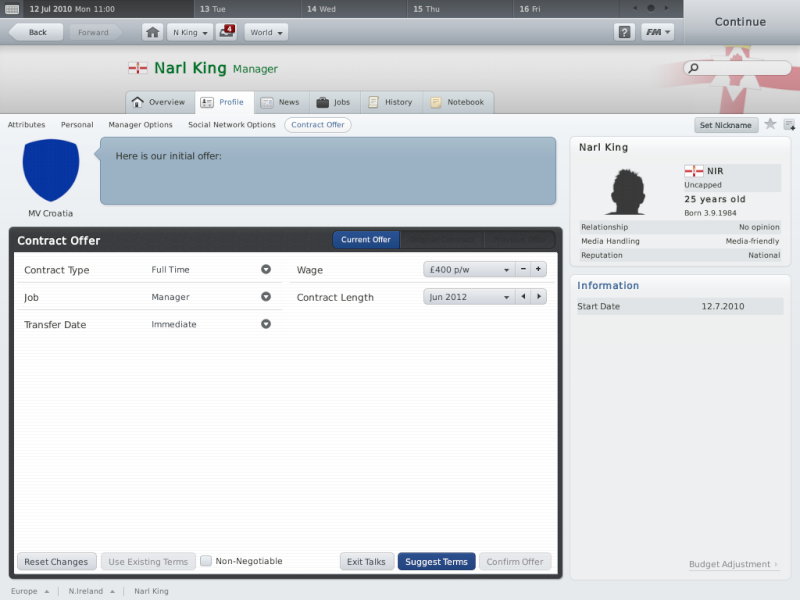 It says on wikipedia that if you win you get automatic entry into the Europa League, so fingers crossed!! 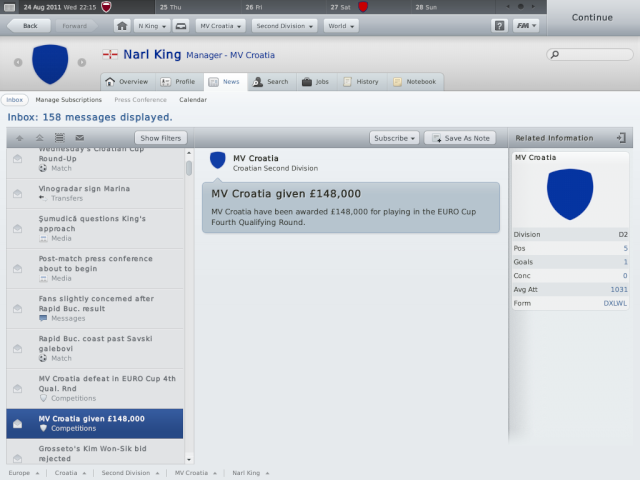 Will Narl King pull off the impossible and save MV Croatia from relegation and not only that, but also win qualification into the Euro Cup via winning the Croatian Cup? Prepare your arteries for overload, you're about to find out. The story was left off with MV Croatia in the relegation zone, 16th. 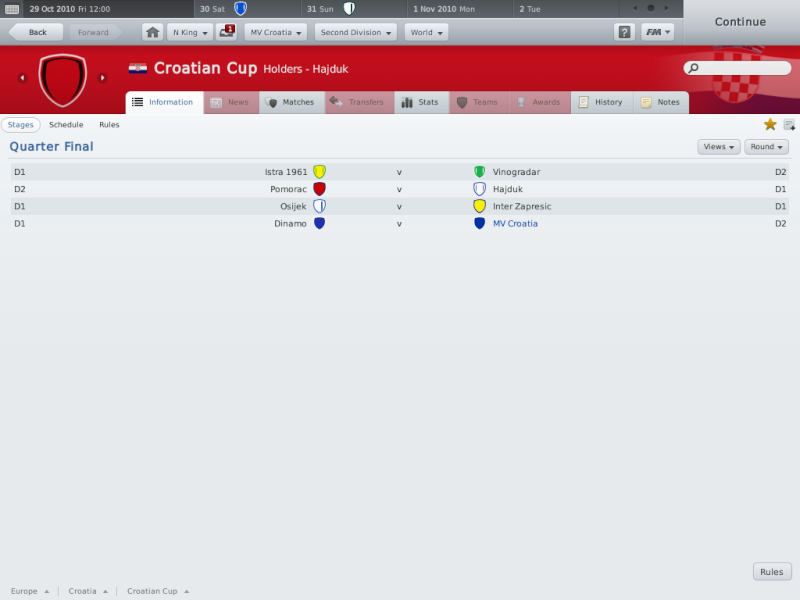 The draw for the Croatian cup semi-final got us Pomorac, a fellow 2nd division team. 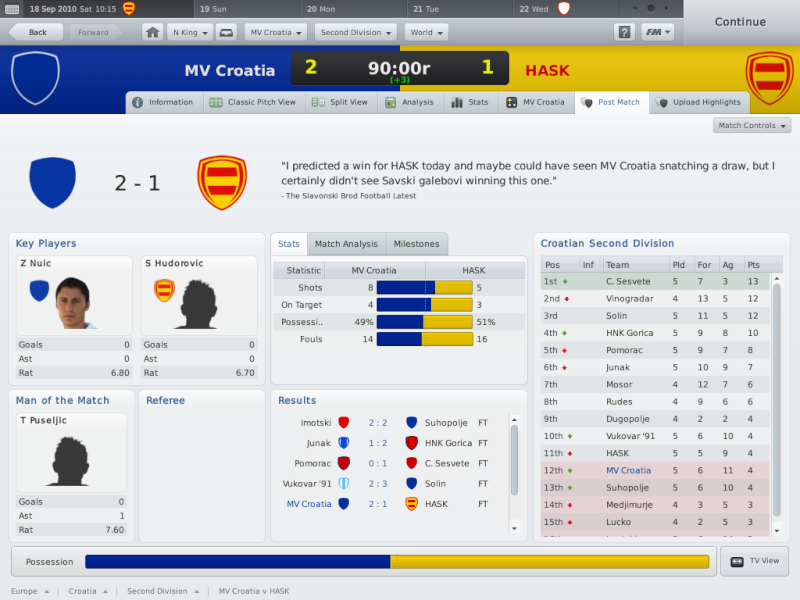 I had a feeling we would win the semis and get to the final. 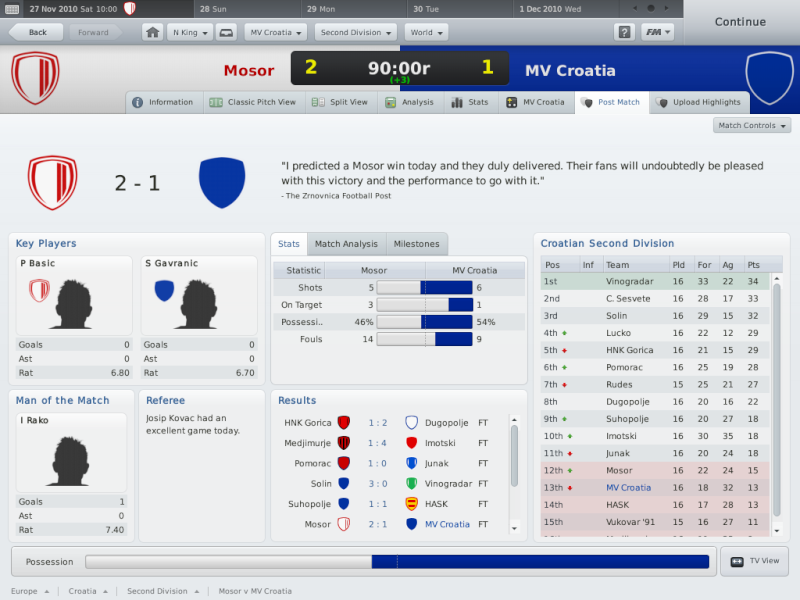 And I was not to be disappointed, as we beat Pomorac 3-2 on aggregate. 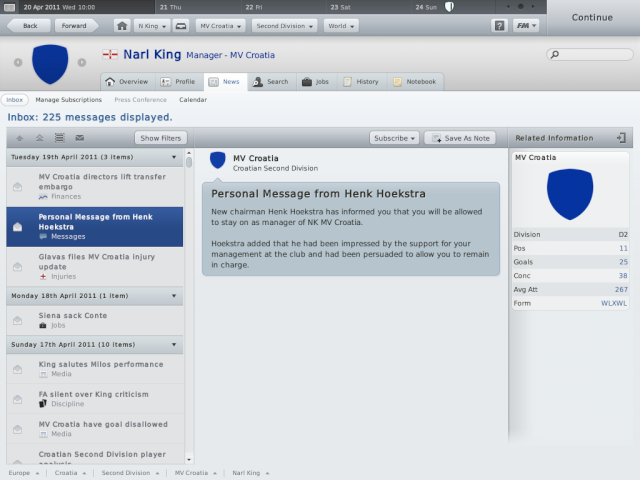 In between league games and the cup run, MV Croatia got new owners in the form of an Amsterdam businessman, who after watching a few of my performances as manager, decided to keep me on. And now... for the big moment. 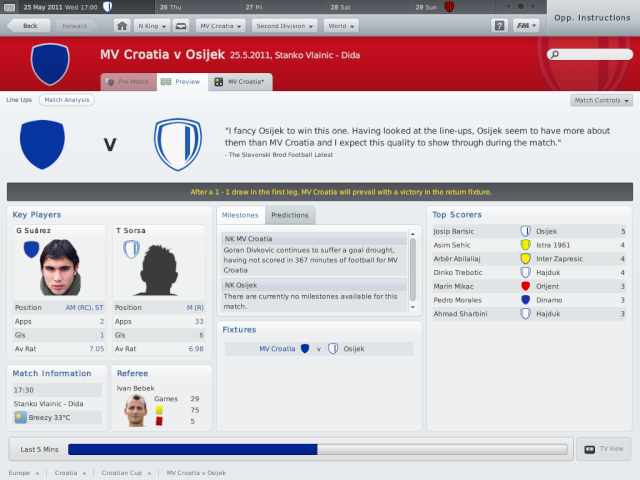 The Croatian Cup Final. To be played over 2 legs, 1 away and 1 at home. The away game was up first. 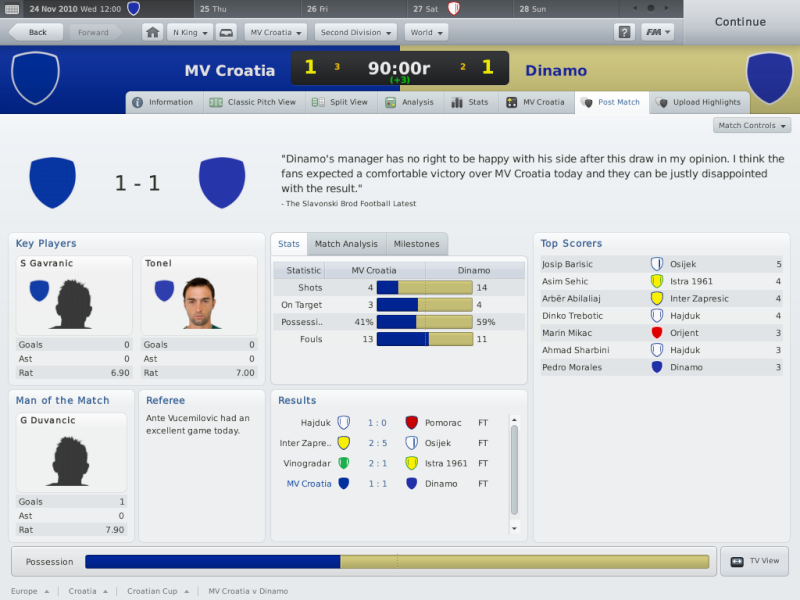 A difficult, hard-fought draw, 1-1, with new striker Suarez playing his 2nd game for the club. Our key man. The return leg was at home. 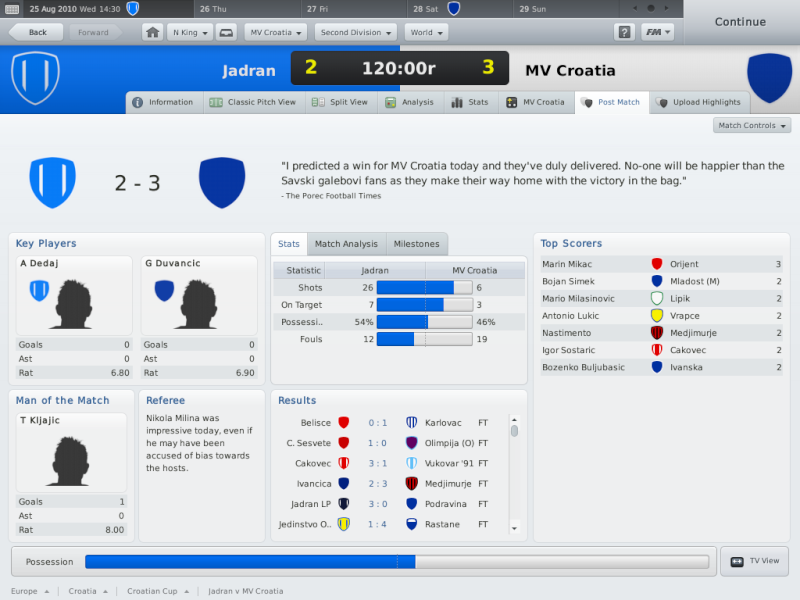 Did MV Croatia stand any chance? I hoped that our opponents would leave gaps at the back trying to outsmart us in attack seeing they were a division 1 side. My hopes proved to be correct, as we hit them on the counter-attack time and again, winning 3-1, with a sensational 18 yard strike by Cubel in the 90th minute sealing the victory. 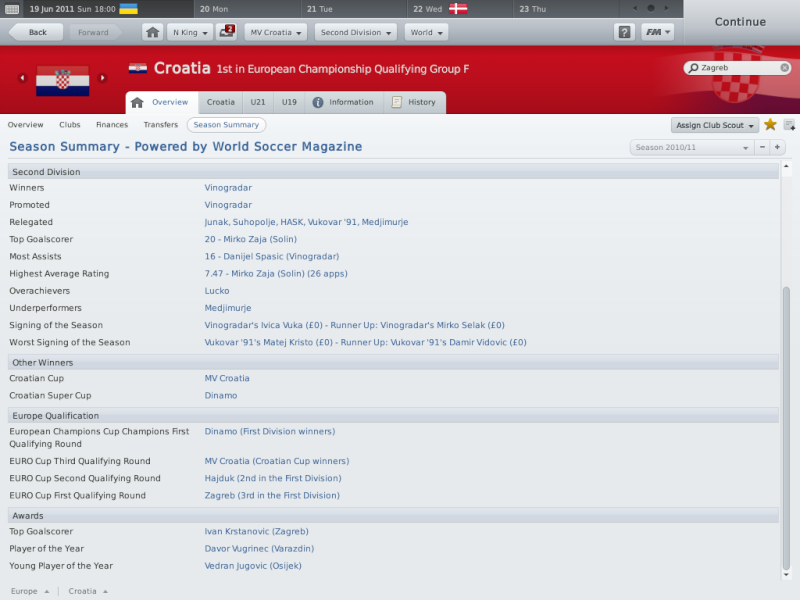 The team had won qualification to the Euro Cup. 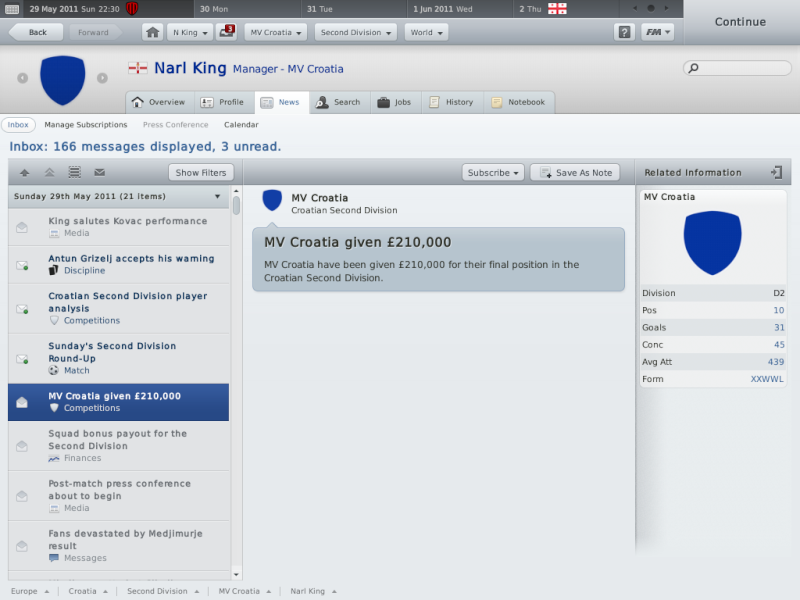 An unbelievable achievement that will go down in the club's history as the biggest ever thing to happen to MV Croatia. Will there be more success for next season? You'll soon find out, as From Croatia with Love returns with more drama, more stories and more excitement. Stay tuned for, From Croatia with Love, Pt II. 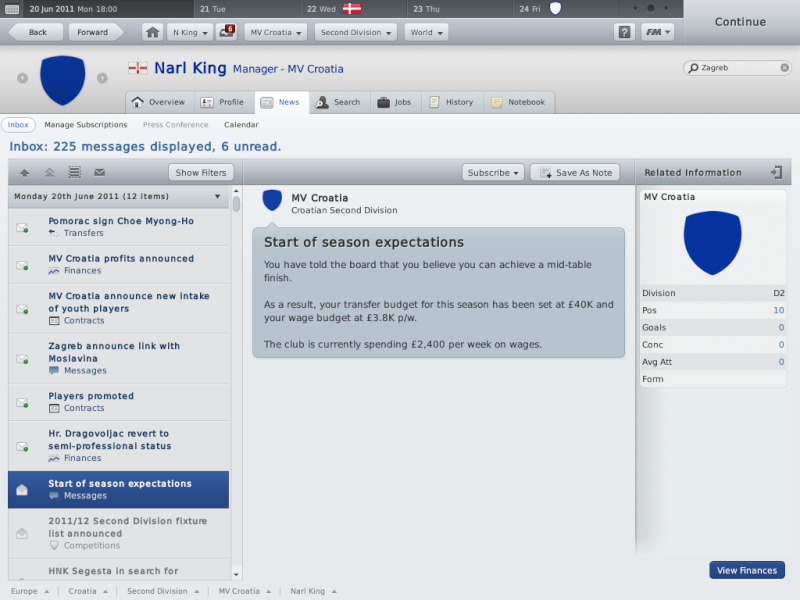 Excellent stuff mate, don't believe the board, you must be a contender for top of the league this new season !!! Wow! This is pure class Narl, really well written, the additions make it just that much better, and an excellent ending to an incredible season - Congratulations on the cup win, and hopefully you can have a steady season in the top division. I agree with you Posh , I was actually told initially that the board want me to attempt to avoid relegation again from the 2nd division... a complete farce. The amount of money I would have got from saying I could win the league was barely worth the bother, so hopefully I can exceed my own expectation of a mid-table finish, with some Euro Cup success to boot. 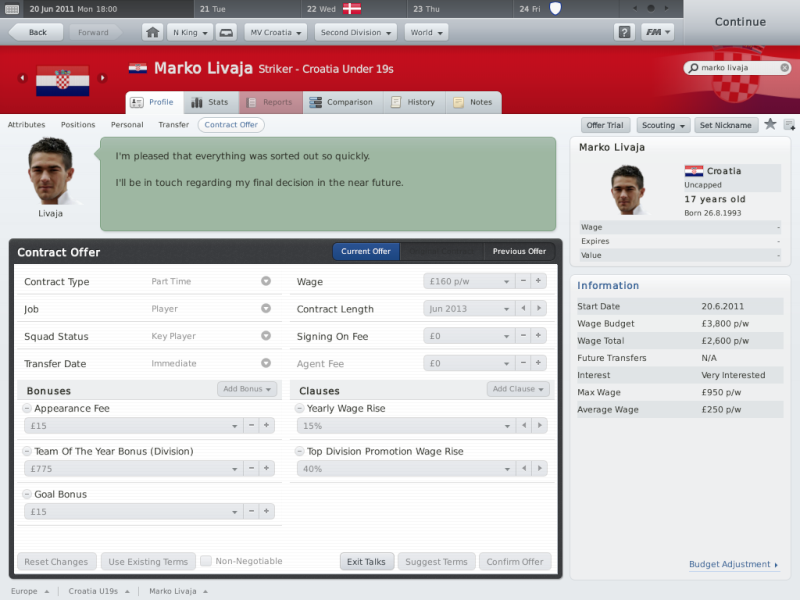 I've already signed 5 new players I think, so the transfers are bombing in at the moment! And so, the new season has begun. 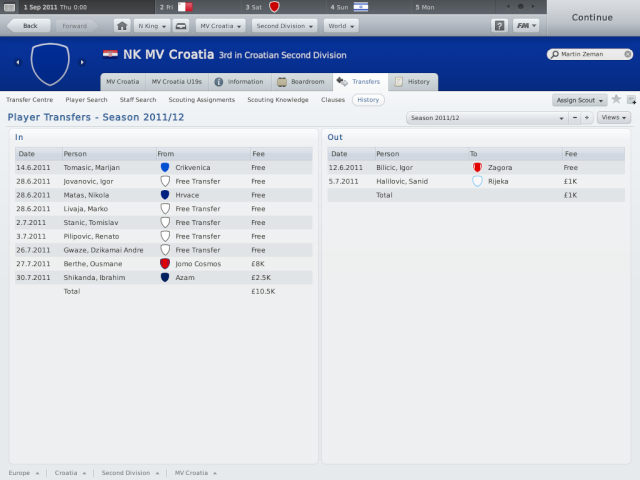 During the off-season, King offloaded 2 players and brought in 9 new ones, of high calibre for MV Croatia to have a chance at competing on 4 fronts, the Euro Cup, the league, the Croatian Cup and finally the super cup. 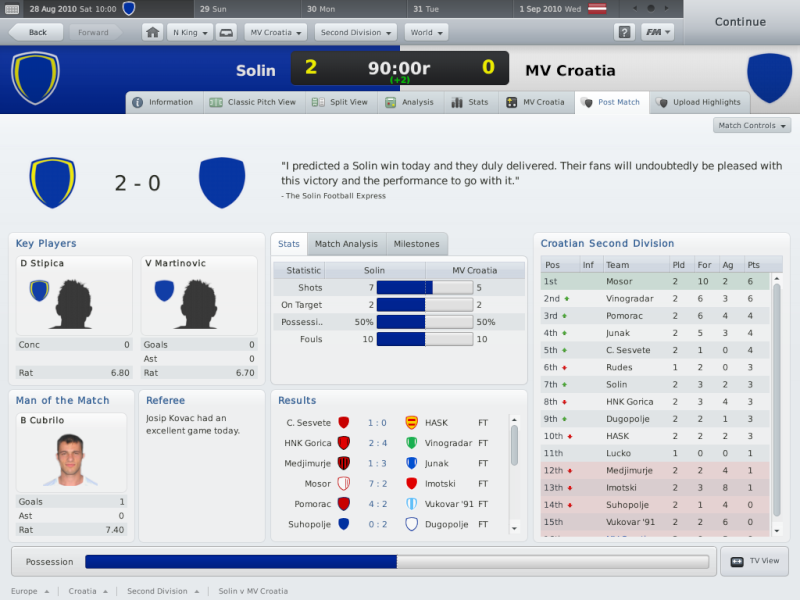 The season started off with the Super Cup game against Dinamo away. 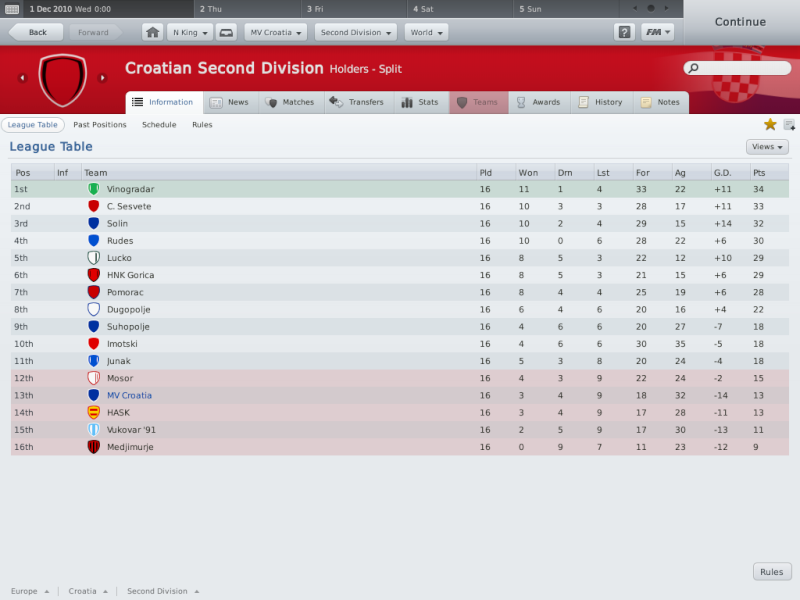 Although I didn't even know there was a Croatian Super Cup, I decided that more silverware couldn't do any harm, and started many of the new players brought in, a stronger squad than last season, when we managed to beat Dinamo in the Croatian Cup. 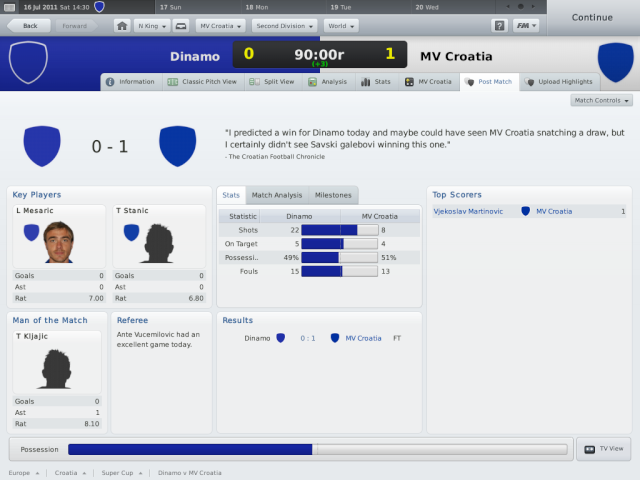 The players didn't disappoint the fans as we beat Dinamo 1-0 in 90 minutes of drama and excitement. 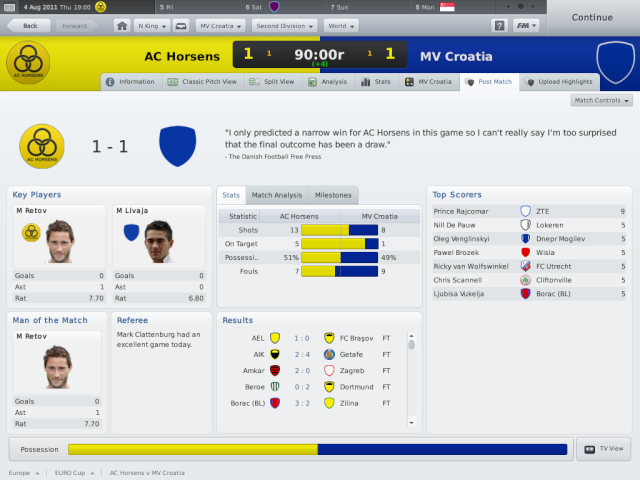 Straight after this, we drew AC Horsens in the EURO Cup, a Danish team of whom I had not heard of before. 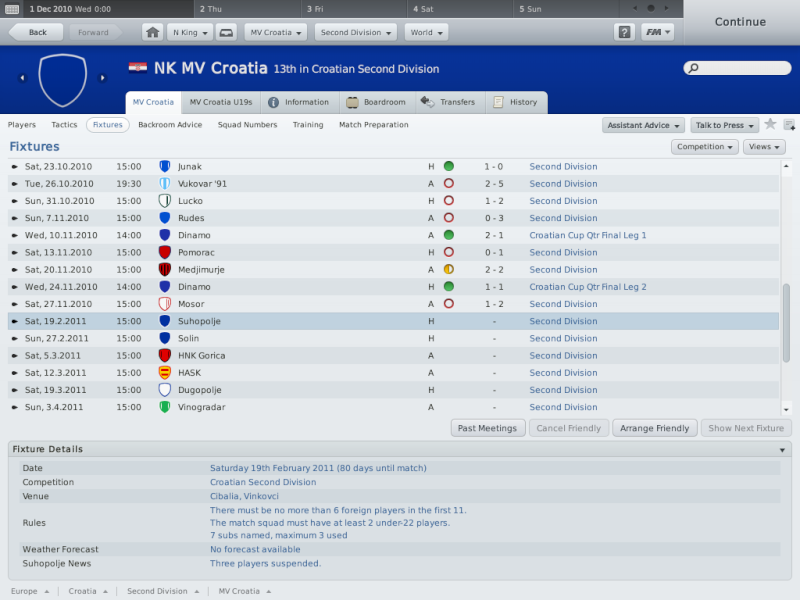 In the home fixture we drew 0-0, rather disappointing as we had many opportunities on goal. Next up, an away fixture, 800 miles to travel, were the players up to the challenge? 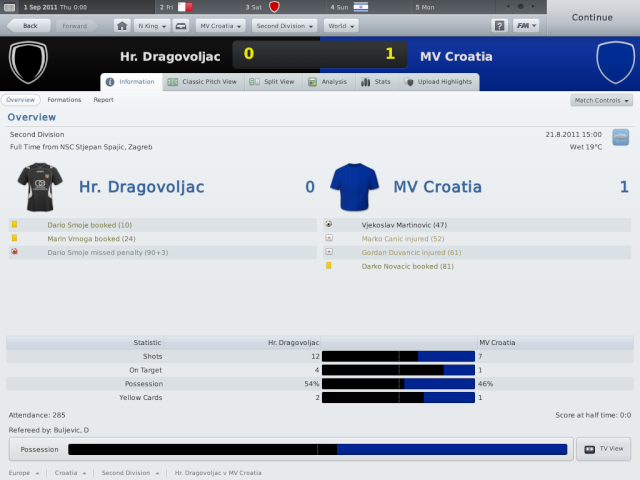 Indeed, they were, as they fought valiantly to get a 1-1 draw, putting MV Croatia through to the 4th Qualifying round of the Euro Cup. Confidence was high in the MV Croatia ranks. However, confidence turned to dismay with Narl King, as the draw for the 4th Qualifying round got MV Croatia a 2 legged tie vs Rapid Bucharest, a much stronger team than ours, who had even got into the Champions League in previous seasons. 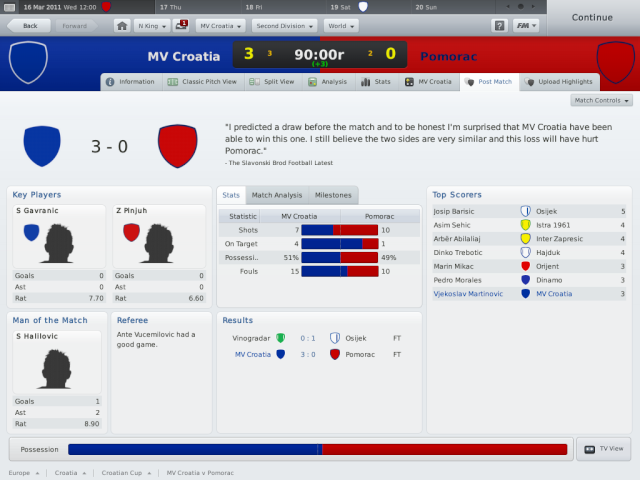 I didn't expect much to come from the tie, apart from the hard-earned cash bonus for playing and we were beat 3-0 on aggregate. 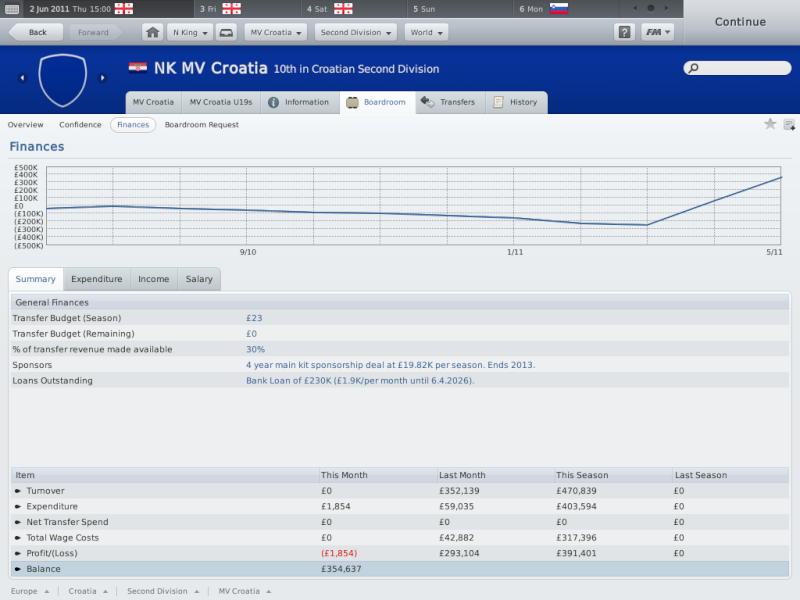 And so, after this beneficial run in the EURO's for the team's finances, the 2nd Division in Croatia started with an away game to recently relegated Hr. Dragovoljac. (hard to spell, I may add ). We managed to beat them 1-0, a feisty win that set us off on the right foot! 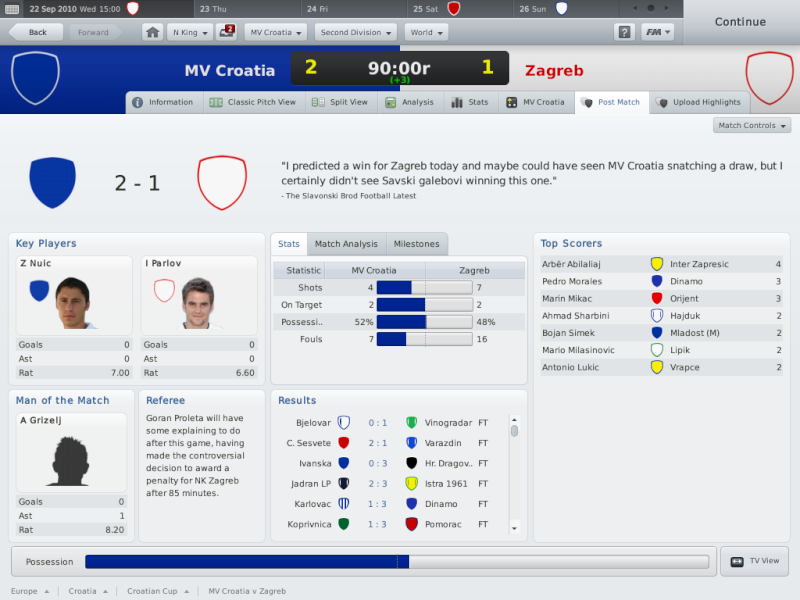 After this was the 2nd leg against Rapid Bucharest, but shortly after we returned to Croatia for a home game against Pomorac, a team I had grown to hate since they beat us twice last season. Plus their name's weird. Enough said. 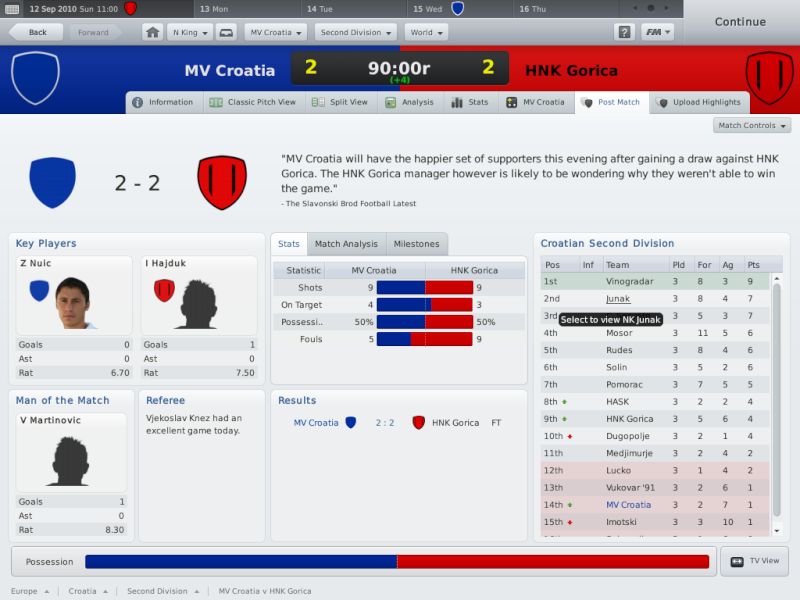 Anyway, I was hoping for success against them, as I had made them my own private rivals, and the players didn't disappoint as we won 3-2, with the winning goal by Stanic after Pomorac had come from behind to make it 2-2. As MV Croatia greet September with optimistic thoughts, I hope to bring you monthly, if not quarterly reports on affairs at MV Croatia. Sounds like it's going great for you there Awesome financial boost from the EURO's too, keep it up! You're on fire Narles! I can't wait to see more updates on this one, I can tell great things are still to come!